The trip was made from September 4th to the 17th, 2001. 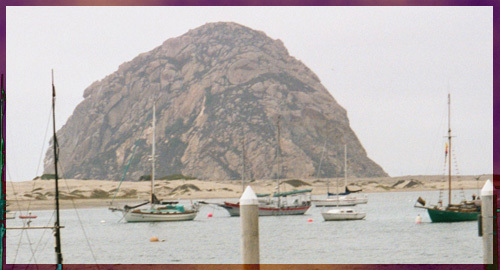 Below is a shot of the famous Morro Rock, located in Morro Bay. Morro Bay is quite a peaceful place with many large homes...homes out of my price range I'm afraid. 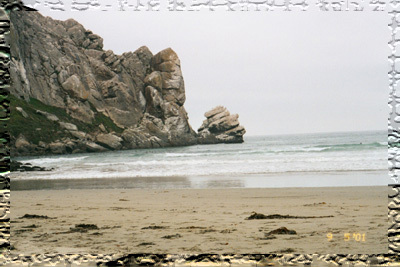 Here's a shot of the beach and the rugged terrain in Morro Bay. The sun wasn't out and it wasn't the warmest of days, but nothing could describe the feeling of standing on the sand and looking out at the Pacific Ocean. On a side note, this was a day of excitement, to some degree. We got to witness Animal Control & Rescue capture a seal on the rocks for medical treatment. I would have offered to help carry the cage up the rocks from the shore, but they already had enough volunteers. Oh well! These are 2 of the souvenirs I got on my trip...the tree was from Morro Bay, while the jar of sand and shells was bought when I was in, as you can tell, Monterey. Yet another shot of the hillside. Couldn't resist this shot as there was so much greenery, along with big houses up in the hills. Can you guess where this is? Yes, that's right...I was in Hollywood! 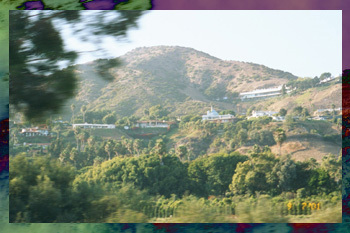 This is a shot of the world-famous Hollywood sign. It wasn't the clearest of days, but it's still a treasured shot. I was hoping to see the 90210 gang while passing through Beverly Hills and Pacific Palisades, but it wasn't meant to be...'sigh'.